Super Clyde, the CBS comedy pilot in which Rupert Grint gets rich and decides to become a superhero, is getting an actor worthy of its Batman-spoofing concept. 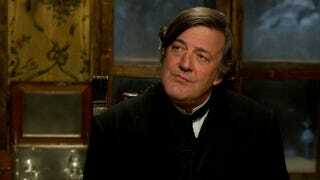 Stephen Fry will be playing the butler who helps Grint's Clyde with his crimefighting quest. Deadline reports that Fry will be playing Randolph, the butler and sidekick to young Clyde. Clyde is a meek fast-food worker who comes into a fortune and decides, taking his cues from Batman, to become a superhero. But given the comedic nature of the show and Fry's prior butler experience, their relationship may be less Alfred-and-Bruce than Jeeves-and-Wooster.